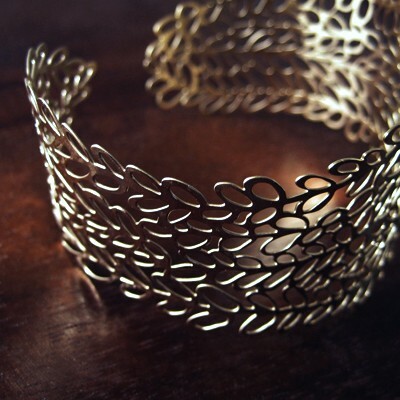 An intricate filigree created from tiny leaf motifs makes up this cuff made of stainless steel. Dipped in 14k gold. Delicate and lightweight. Steel version is available by custom order (See last photo). Please email custom@prismeradesign.com for a quote. Note: Please allow 3 weeks for shipment as this piece is made to order.